This Hong Kong Style Tomato Sauce has to be one of my favorite comfort sauces from my hometown. It’s well-balanced with depths of sweet, savory, tangy flavors, bursting with umami deliciousness. You’re going to love it! So, what are Cha Chaan Tengs? If you get a chance to visit Hong Kong, you’ll find Cha Chaan Tengs everywhere you go! These restaurants serve local Hong Kong style comfort food at cheap prices with super fast service (you usually get your food within 5 minutes!) A perfect-fit for Hong Kong’s hectic city lifestyle. Loved for their big portion, cheap, fast, and all-around comfort food we grew up eating. And this Instant Pot HK Tomato Pork Chops 港式茄汁豬扒 we’re making today is a classic favorite at Cha Chaan Tengs. Our version of Hong Kong style Tomato Sauce is very similar to the tomato sauce you get from Cha Chaan Tengs. But, we kicked it up a notch by adding extra ingredients that help intensify the umami flavorings. Oh yaasss…this tomato sauce works wonder with pork chops…so good! Easy Instant Pot HK Tomato Pork Chops Recipe: Juicy tender pressure cooker pork chops, soaked in delicious umami-packed tomato sauce. Super comfort food that both adults and kids are going to love! Tenderize Pork Chops: Use the back-end of a heavy knife, pound both sides of pork chops to tenderize the meat. Marinate Pork Chops: Marinate tenderized pork chops for 20 minutes with ½ tsp (2.3g) sugar, ¼ tsp (1.5g) salt, ¼ tsp (1.25ml) sesame oil, 1 tbsp (15ml) light soy sauce, and ½ tbsp (7.5ml) dark soy sauce. Prepare Pressure Cooker: Heat up your pressure cooker (Instant Pot: press Sauté). Make sure your pot is as hot as it can be when you place the pork chops in the pot (Instant Pot: wait until the indicator says HOT). This will prevent the pork chops from sticking to the pot. Prepare Other Ingredients: Clean mushrooms with a damp paper towel and prepare remaining ingredients as listed. Sauté Pork Chops: Add peanut oil in the pot. Ensure to coat oil over the whole bottom of the pot. Add in marinated pork chops, then let it brown for roughly 1 – 1 ½ minute on each side (don’t need to constantly flip the pork chops). Do not let it burn. Remove and set aside. Brown Onion, Shallot, Garlic, and Mushrooms: Add in sliced onions, diced shallot and stir. Add a pinch of kosher salt and ground black pepper to season if you like. Cook onions and shallot for roughly 1 minute until softened. Then, add garlic and stir for 30 seconds until fragrant. Add in mushrooms and cook for another minute. Taste seasoning and adjust with more kosher salt and ground black pepper if necessary. Deglaze: Add ¼ cup (63ml) water and fully deglaze the bottom of the pot with a wooden spoon. Create Tomato Sauce: Add in ¾ cup (188ml) water, 2 tbsp (30ml) ketchup, 1 tbsp (14g) sugar, 1 tsp (5ml) Worcestershire sauce, and 50ml tomato paste (See Tips). Mix well. Pressure Cook Pork Chops: Place pork chops back with all the meat juice in the pot. Close lid and pressure cook at High Pressure for 1 minute. Turn off the heat and Full Natural Release (roughly 10 minutes). Open the lid carefully. Taste & Thicken Tomato Sauce: Remove pork chops and set aside. Turn heat to medium (Instant Pot: Press sauté button). Taste the seasoning one more time. Add more salt and pepper if desired. Mix cornstarch with water and mix it into the tomato sauce one third at a time until desired thickness. Serve: Drizzle the tomato sauce over the pork chops and serve immediately with side dishes! Tenderize Pork Chops: Make sure to tenderize the pork chops before marinating them. This is an important step. Mixing in the Tomato Paste: Mixing in 50 ml tomato paste to 250 ml of water should not cause scorching. If you are unsure, just let the tomato paste sit on top of all the other ingredients unmixed. Avoid mixing in the tomato paste if you exceed the 1 cup of tomato paste to 5 cups of water ratio. *The Total Cooking Time does not include idle/inactive time. You wouldn’t want to overcook pork chops as they’ll become tough and dry! Since pork chops cook in a flash in the pressure cooker, we did an Instant Pot Pork Chops Experiment to find the best cooking time to make perfect pork chops in Instant Pot. After testing 5 batches of Instant Pot pork chops (I was starting to dream about pork chops in my sleep..hehe~), we found cooking at High Pressure for 1 minute, then Natural Release creates delicious and perfectly cooked pork chops. So this is the cooking time we’ve used to develop this recipe. Try to choose pork chops with some marbling of fat. The pork chops we used were roughly 1.25 inches thick. Make sure to tenderize the pork chops before marinating them. Do not skip this important step!! Mixing in 50 ml tomato paste to 250 ml of water should not cause scorching. If you are unsure, just let the tomato paste sit on top of all the other ingredients unmixed. Avoid mixing in the tomato paste if you exceed the 1 cup of tomato paste to 5 cups of water ratio. We used water instead of our homemade unsalted chicken stock in this recipe as most Cha Chaan Teng use water (way cheaper) to make this tomato sauce. Late response, but how did it come out? These were easy to make and absolutely delicious! This recipe looks great. What is the cooking time if I want to us boned-in pork chops? Or, is that not recommended? If you are using 4 pork chops, 1 minute + 10 minutes natural release should work just fine! What would the cooking time be for 8 boneless, skinless chicken thighs? I’m super excited to make this!!! This baked over fried rice with cheese is my go to at hk cafes! Thank you for your question. It will be 5 minutes and 10 minutes natural release. So glad I found your web site. Everything I’ve made from it so far has turned out great. Made the HK tomato pork chops…followed the recipe exactly, except omitted the mushooms. So good! The sauce was magnificent. Thanks for all your work and tips. They are much appreciated. Looking forward to cooking many more of your recipes. Can’t wait to try it! I would double the recipe to feed 6 people. I’m interested in also adding pot-in-pot rice. Could you suggest quantity of rice? Like 1 cup? Or 2 cups? Also, how much would I change cooking time? Thanks! Thank you for your question. Adding pot-in-pot rice will overcook the pork chops too much. I recommend using this recipe for a pot in pot meal. Very good! The whole family enjoyed this simple and easy to make recipe. Thank you! If I plan on doubling or tripling the portion do I have to adjust the timing on the instant pot. Raising it more than 1 minute? Thank you for your question. You will want to decrease the cooking time to 0 minute as the get up to pressure time will be a lot longer. Made this dish tonight and it was so delicious. I double the pork chops and ingredients because I was serving 7 people. I’m so happy I found your website, the recipes are so easy to make. Let’s see, what’s next? I feel like eating pork again, will make your pork roast recipe (again). Thanks for sharing! Favorite recipe so far. I’ve been making this meal for over 2 years now and I make it almost every week. It’ll take care dinner for 2 nights for both my husband and I. The only change I made to the recipe was using brown sugar instead of white sugar, since I don’t have white sugar in the house. Super easy to make, quick and tasty. This meal is like our “oh crap I forgot about dinner” moments when we’re both swamped with work. Quick run to the store after work, and less than an hour later we’re digging into our plates. Plus we have dinner for the next day! Got my instant pot after Thanksgiving, so glad I found your website! First dish I made was the century old egg with pork congee, it was delicious!! I am a little unclear about when to add the tomato sauce in this recipe. Should I have added the tomato sauce to the instant pot with the pork chops to pressure cook for 1 minute? The way I read the recipe, after pressure cooking the pork chop and allowed NR, I took out the pork chop, turned on saute to add the tomato sauce and slowly mixed in the cornstarch/water to thicken the sauce, then I poured some of the finished sauce over the pork chops to serve. It was tasty but I don’t know if I followed the recipe correctly. Thanks for your hard work in creating these delicious recipes! The tomato sauce is added into the Instant Pot on step 8 and pressure cook along with the pork chops. The thickening step is after pressure cooking. Can you substitute coconut amminos for soy sauce ? Coconut aminos will work fine! As of right now probably the best pork chops I have ever had! Can’t wait to try more recipes from your blog. This recipe is yummy. Fast, easy and oh so tasty. I tried the pork chop but all I had was bone in and I cut the bone out. This recipe turned out great. Happy to hear how the recipe turned out! Hi there! May I know how much chicken breast to use for this recipe? Thanks! You can use 2 – 4 chicken breast and it will take 5 minutes and 8 minutes natural release. Hi Amy and Jacky. Wow another great dish. My husband couldn’t stop raving about it. Thanks for sharing. Glad to hear your husband enjoyed this Hong Kong dish!! Thumbs up!! I made this today. It was easy and turned out perfect! I did add a bit of honey and salt to the marinade. The tomato paste gave the sauce an acidic taste so I added a pinch of baking powder. The sauce has an American barbecue sauce flair but milder, and we loved it this way. The mushroom texture was perfect. Since there was quite some fat rendering from the pork chops I used, I strained the sauce into a fat separator (to prevent the onion- garlic mixture from clogging the fat separator opening), poured out the fat before putting the liquid and the onion- garlic mixture back in the pot. Thank you for sharing! Note: May I suggest that you include the total weight of the meat used in the recipes since the portions may vary from one grocery to another. It would help us adjusting the seasoning if ever the weight is not close to what you had. We have started including the total weight of the meat used in our newer recipes!! Thank you so much for your kind words and rating once again! I just made this recipe, and not only was this easy to make, but it is delicious! I did not make any changes, and made the recipe exactly. The sauce is incredible! I agree that the marinade is very important. The pork chops had great flavor and they came out tender. However, instead of rice, I put it over cauliflower rice. I would certainly make this recipe again. Cauliflower rice is a great healthy alternative! This is the only recipe of yours that I found that I did not really like. It was the sweetness of the sauce – perhaps had I not put the sugar in, when ketchup was being used (as it is sweet enough) I would have liked it. I’ve made nearly all your recipes and they turn out just as you picture and have some facourites, like soy sauce chicken, etc. Thanks for all your testing, and recipes, your instructions are great! Now, if you can just stop all your messages arriving into my Inbox – everything will be very good. Just to let you know, I received the replacement recipe book that I found defective. The sauce should only be slightly sweet and not overly sweet. Is it the facebook notification messages? If so, you can turn it off on facebook. I love Love Love your recipes, thank you so much!!! I made this with the pork chops and want to make it again but I only have chicken breasts! What are your thoughts on the substitution, what should I change? This HK tomato sauce will pair well with chicken as well. I would recommend chicken thighs for 6 minutes + 10 minutes Natural release. If you can only use chicken breasts, it will take 5 minutes + 9 minutes release. Sorry about the double post. I thought I hadn’t processed the message properly yesterday as it didn’t show up on my mobile phone today. Whoops! But, then, I guess you at least realise how much we love your recipes hehe. No worries. We are so happy to see your kind comments and feedbacks! 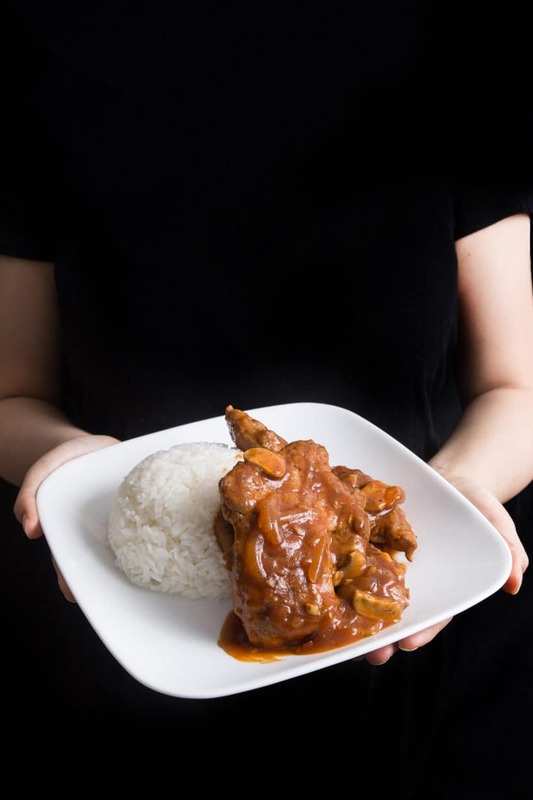 Try our Pork Chops is HK Onion Sauce and let us know what you think! We can’t decide which one we favour between the HK tomato or the HK mushroom gravy recipe. Both are deliciously moreish. Mark loves both so they will make regular appearances at our dinner table. We used 1 1/2 tablespoons of tamari due to allergies, but otherwise kept to your recipe. Unlike others, we’ve yet to encounter a ‘burn’ message on our 8 litre pot but that’s probably because we stick to tried and tested recipes and read all the comments for tips too. Mark loved this equally as much as the HK mushroom gravy recipe. Another winner which will find itself on our table regularly. Kept to the recipe except using 1 1/3 tbsp of tamari due to allergies. We have yet to encounter the burn message… probably because we’ve been using tried and tested recipes up until now. Can I use “bou jai faan” soy sauce as a replacement for dark soy sauce? Also I only have vegetable oil I wonder if that will change the flavour instead of using peanut oil. Vegetable oil will work instead of peanut oil. Bou jai faan soy sauce is more sweet when compared to dark soy sauce so please adjust accordingly! This is my first recipe from your tested collection and it was good! When I was looking at this recipe, I was imagining the dish would taste more tangy (more ketchup & A-1 ish – if that makes sense). I’m originally from HK but I haven’t had this in a very long time so I had nothing to compare it to. Is the sauce suppose to be on the tangy or savory side? Do you recommend I tweak anything? This recipe is definitely a keeper at my house! There are a few variations to this sauce. Some restaurants make it more tangy and some make it more savory. Tweaking will depend on your personal preference. Can i just all dark soy sauce? I have aloha shoyu which i believe is dark soy and i really dont want to go looking for light soy sauce. Dark soy sauce is supposed to be sweet and slightly salty only. Is Aloha Shoyu like that? If it is, I would recommend seasoning with more salt after pressure cooking. Please taste and adjust accordingly. Can I use sliced pork tenderloin for this recipe? I can cut them into 1”-1.25” thick, and cook with the same cooking time?? Thanks! Pork tenderloin is a lot more lean and will become tough when overcooked. I would recommend using 1 minutes + Natural release. can I cook it with frozen pork chops? Thanks! Pork chops will get tough and dry if it is overcooked so I would recommend cooking the pork chops thaw to make sure they get cooked quickly. Pork chops don’t freeze well as they will become tough and dried. Absolutely love this recipe. My husband and I ate the leftovers for breakfast! Thank you once again for your kind comment and rating! Hi! Thank you for this recipe. My husband and I have searched for years for a HK style pork chop recipe to make at home. I have an 8-qt pot and probably about 6-8 pork chops in the package. Do you recommend doubling the recipe? How should I adjust the cooking time? Do you recommend stacking the pork chops while they cook? Thank you!! I look forward to trying this recipe this weekend. Stacking pork chops is fine as long as they are at least partially submerged in the cooking liquid. Your comments have been so incredibly encouraging and kind! Thanks for the quick response.. I really liked the sauce so I’ll try again. If I try with chicken thighs, would I need to marinate like the pork chops? They will take 6 minutes + 10 minutes Natural Release. The sauce is very flavorful but the pork chop is bland and tough. I followed the recipe exactly. What went wrong? Sounds like something is not correct with the marinade. Any chance Low sodium soy sauce was used instead of light soy sauce in the marinade? If the pork chop is tough, it means it is quite thin or may not have enough marbling. You may want to reduce the cooking time to 0 minutes. I just got the instant pot and I love your recipes. 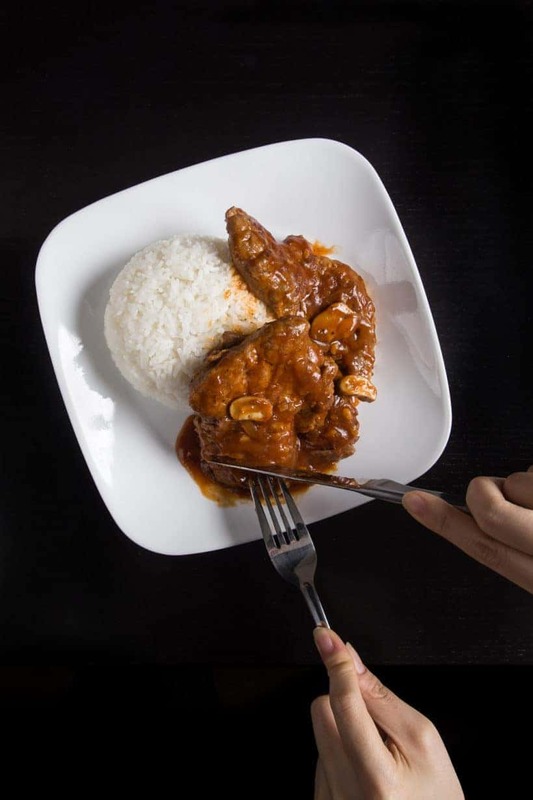 For this pork chop recipe, can I cook rice at the same time? (Ie. pot in pot method). Also, your pot in pot recipes use Jasmine rice. Can I substitute with Japanese short grain rice instead? What adjustments would I need to make? Since pork chops will go dry and tough if overcooked, I will not recommend cooking rice with pork chops at the same time. Pork shoulder/butts will be a better choice. I am still doing more testing on short grain rice for the exact water ratio + timing. If my chops are less than an inch to begin with, should I still pound them? Does the cooking time change? You can set the pressure cooking time to 0 minute instead of 1 if they are thinner. I’m trying for recipe three of yours ; ) I spent the last hour scouring the chicken recipes but I don’t have the various ingredients. I have all of the ingredients for this sauce, but we don’t eat pork… Can I make this with chicken instead? If yes, what kind would you recommend? Bone in/ skin on/ thigh/ leg? Thanks much!! The sauce will work for chicken as well! Bone-in Skin on Chicken Legs (8 minutes + 10 minutes Natural release) or thighs (6 minutes + 10 minutes Natural release) will work! Hi Amy and Jacky! I’ve just spent an hour and a half devouring your website, after a disaster with overcooked beef stew in my Instant Pot last night. Today I am going to redeem myself. Can you tell me how to adapt this recipe of pork chops with pork shoulder instead? Also do you have any recipes of Chinese style pork stew with pork shoulder? I like this cut because it is cheap and fatty and good for Chinese sharing style of eating, rather than the Western individual style. We love the pork shoulder cut as well! It is perfect in the pressure cooker. We will be releasing more recipes for this cut soon. 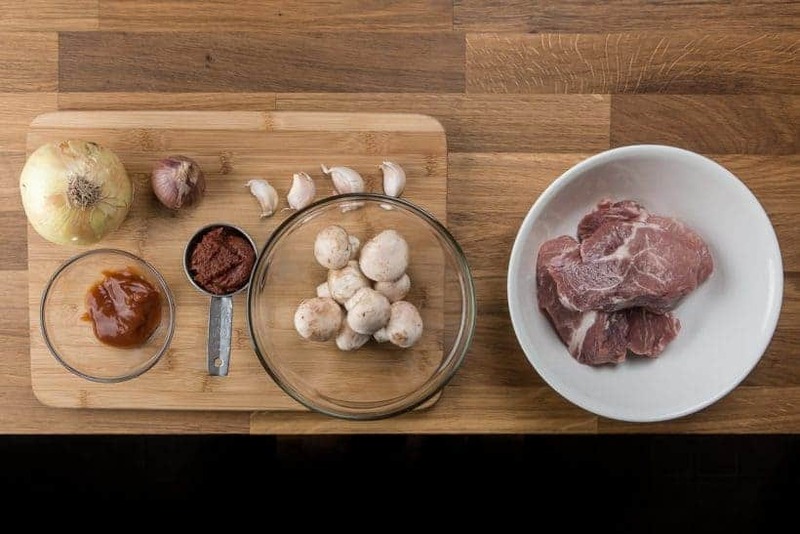 If you need a reference on pork shoulder, here is a Japanese recipe. Is there a substitute for the dark soy sauce. We can not get it in our area. It would be nice to use something we can readily purchase locally. Dark soy sauce adds sweetness and color to the sauce so omitting it in this recipe will be fine. Do taste and adjust accordingly. You may need a tiny bit more sugar at the end. Happy Easter & have fun cooking! I just made this recipe tonight and was blown away with its deliciousness. I was skeptical about the 1 min at high pressure but did it anyway and the pork was tender and done just right. Yea! I realized that after browning the meat and sauteing the onions etc, everything had already started cooking and only needed that 1 min plus the 10 mins NR to tenderize. May I make a couple of TINY suggestions about the directions? It would be helpful to note for the 1 cup water: Divided, 1/4 cup for deglazing, 3/4 cup for tomato sauce. Then, in step 5 “Remove and set aside (the chops) in the marinade.” And, in step 9, make clear that along with the pork chops the “meat juice, marinade, and tomato sauce go into the pot.” First time using the recipe and I wondered when the tomato sauce went in and then realized that it HAD to go in with the meat or there wouldn’t be enough liquid to pressure cook!! I had 4-6oz boneless pork loin chops and they fit perfectly in the bottom of the IP. Tonight I started this recipe at 4pm and at 5:30pm we were done eating and the kitchen was clean. WOW!! Thanks again for all your help with great recipes for my InstantPot!! thank you for your kind comment and suggestions. Hi!!!! Figured ill ask here. I had a pack of 6 chops bone in chops but i deboned them all. I couldn’t tenderize it properly thats why. Can i cook all 6 pieces or is 4 the max i can put in there? You can cook all 6 pieces together, but I would decrease the cooking time to 0 minutes at high pressure since the get up to pressure time will be increased. Hi there. I’ve made this recipe before and the sauce is absolutely amazing. If I were to make only two pork chops but with the same amount of sauce, would I pressure cook them in half the amount of time? Appreciate your answer. Thanks. If the pork chops are thin, you can decrease the pressure cooking time to 0 minute. This was our first instant pot meal and it was a hit!! Delicious, leftover sauce going over some pulled pork and collard greens for lunch tomorrow…. Congrats on your first Instant Pot meal! This was my first Instant Pot recipe and it was basically a failure! The directions were very easy to follow and the sauce was delicious, but our pork chops were VERY dry. We had 1.5″-2″ thick chops and I could not get them nearly as thin as in the video, maybe to about 1″. After pressure cooking x1 min I left it on the “keep warm” function while tending to something, probably for 30mins or so. Why was my pork dry?! Did I tenderize too much trying to reach the same thinness or let it sit on “keep warm” too long? I thought the whole point of this appliance was a little more flexibility and not needing to watch it! Side note: I could not find dark and light soy sauce at my local grocery so I used 1 Tbsp Tamari and 1/2 Tbsp regular low sodium soy sauce. Thank you in advance for your help! The pork chops were dried because they were left in the keep warm function. The residue heat from the pressure cooker will continue to cook the pork chops so they were overcooked. Lean meat such as pork chops and seafood are best served immediately right after they have been cooked. Fatty meat such as chuck roast and pork shoulders are more suitable for cook ahead or leftovers. The pork I bought at the store is 1.5 thickness instead 1.25 of what you recommended. Should I cook it longer? If so how much longer 2 mins instead of one. 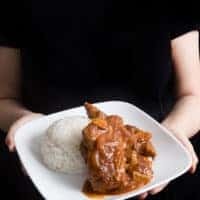 Hi Amy Jacky, I tried this recipe a couple nights ago and the pork chop was very tender, but I found it “bland” and “not juicy enough”, despite the sauce on top. Is it because I did not pound the pork chop to that thin? Should I brine the pork chop instead? And if I brine the pork chop, do I need to pound beforehand and/or marinade with your ingredients after? I’m looking forward to trying it and perfecting it. Thanks. The pounding should be done beforehand if brining the pork chops. Bland usually means the sauce or the pork chops were under-seasoned. Taste and season the sauce with more salt as it will brighten up all the flavor. Try thickening the sauce by reducing or using cornstarch as it will help the sauce clings onto the pork chops. Is there a replacement for peanut oil as my son is allergic to peanut butter? Canola oil or corn oil will work as a replacement. I am thinking of trying this recipe with chicken drumsticks, as my family does not eat pork. Should I adjust the cooking time? thank you for your question. Yes you will have to adjust the cooking time to 8 – 9 minutes + natural release. I made this for dinner last night and it was delicious! I didn’t have mushrooms so I used dehydrated mushroom powder. Still great! I tried the recipe tonight and I was confused about one thing. Natural release…got that part. Do I leave the pot in the keep warm setting after it’s done cooking or do I turn it off while waiting for it to release naturally? Thanks. For the Instant Pot, it will not matter as the keep warm function will not kick in until the temperature is below 80°C (176°F). It was fantastic to know about your blog, I like most of your recepi and will try to cook one each day. Today I cook HK style pork chop, the meat is tender but the sauce was still runny even after I added 1 tablespoon of cornstarch. May I know why？how should I do it so that it is not runny? I would like to attach a photo of the dish that I cooked here. How do I do it? Make sure to taste and season with salt after the sauce has been reduced to desired thickness. There is no function to attach a photo on this site yet. You can share a photo with us on our facebook page or group :)! Made this tonight. I tenderized the chops but not to the thinness in the video. Even still they were very thick and I worried about the 1 minute pressure time but they came out very tender and nicely cooked! The sauce is wonderful and I made this with cauliflower rice to save on calories and carbs. Happy that you enjoyed this pork chops recipe. Have fun cooking! In the recipe, it says to use pork chops that are 1.25 inches thick. But in the video the chops looked really thin! Do you pound them until they are that thin? I’m not even sure I could do that so I’m hoping not haha. Is the 1 minute cooking time supposed to be for the 1.25 inch thick chops or for thinner? Thank you! The pork chops will fluff back up after cooking. The 1 minute cooking time + natural release is for any pork chops that are less than 1.25 inch in thickness. I tried this recipes and it taste super good. But I have a question, when it’s done and I turned it off, do I move it to vent( on the lid) to let the stream come out or I just leave it at sealing? When it is done, you should leave it at sealing until the floating valve (the metal pin) drops. This is call a natural release. I have bone in pork loin chops, will that change anything for this recipe? You don’t have to change the cooking time for bone-in pork loin chops. Make sure to brown the pork chops beforehand! I made this for dinner last week, and it was a hit with the family! Thank you so much for this blog and recreating all the comfort food from my youth, but now so much easier to cook in the Instantpot! We are so happy that your family liked this pork chop recipe!!! i would like to double the recipe. Do I use the same cooking time? Hi Rene, thank you for your question. Yes, the cooking time will stay the same. Try not to stack the pork chops together too tightly together.